The Acumatica Financial Management Suite Accounts Receivable (AR) module is used to enter customer invoices, send customer statements, collect and apply payments, verify customer balances, track sales commissions, and deliver customer reports. The AR module is integrated with all other Acumatica modules and can be deployed on premise or hosted at a data-center so you can control where sensitive data is stored. Access 100% of your accounts receivable features from anywhere using any popular web-browser. Reports and dashboards help you identify problems before they occur. This includes over limit accounts, aging accounts, expiring credit cards, and more. Use sales contracts to bill recurring fees, one time fees, setup, overage, and other charges. Sales, service, finance, and support can all access customer bills and reports according to customized workflow and approval processes. Predictive entry and flexible screen layouts reduce time spent entering data. 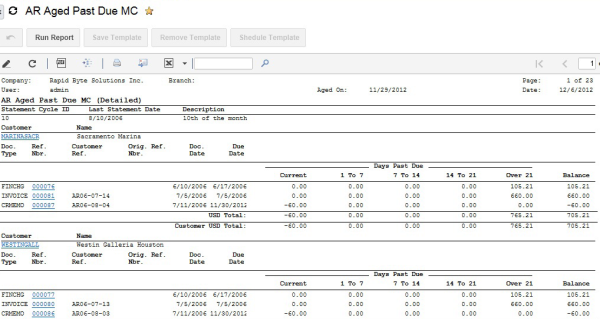 Create HTML, PDF, or Excel documents which can be printed or emailed according to client preferences and billing cycles.